The Caribbean Sea (Spanish: Mar Caribe; French: Mer des Caraïbes; Dutch: Caraïbische Zee) is a sea of the Atlantic Ocean in the tropics of the Western Hemisphere. It is bounded by Mexico and Central America to the west and south west, to the north by the Greater Antilles starting with Cuba, to the east by the Lesser Antilles, and to the south by the north coast of South America. The entire area of the Caribbean Sea, the numerous islands of the West Indies, and adjacent coasts, are collectively known as the Caribbean. The Caribbean Sea is one of the largest seas and has an area of about 2,754,000 km2 (1,063,000 sq mi). The sea's deepest point is the Cayman Trough, between the Cayman Islands and Jamaica, at 7,686 m (25,217 ft) below sea level. The Caribbean coastline has many gulfs and bays: the Gulf of Gonâve, Gulf of Venezuela, Gulf of Darién, Golfo de los Mosquitos, Gulf of Paria and Gulf of Honduras. The Caribbean Sea has the world's second biggest barrier reef, the Mesoamerican Barrier Reef. It runs 1,000 km (620 mi) along the coasts of Mexico, Belize, Guatemala, and Honduras. 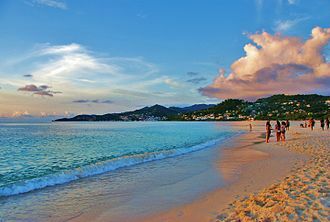 The name "Caribbean" derives from the Caribs, one of the region's dominant Native American groups at the time of European contact during the late 15th century. After Christopher Columbus landed in the Bahamas in 1492, the Spanish term Antillas applied to the lands; stemming from this, "Sea of the Antilles" became a common alternative name for "Caribbean Sea" in various European languages. During the first century of development, Spanish dominance in the region remained undisputed. From the 16th century, Europeans visiting the Caribbean region identified the "South Sea" (the Pacific Ocean, to the south of the isthmus of Panama) as opposed to the "North Sea" (the Caribbean Sea, to the north of the same isthmus). The Caribbean Sea had been unknown to the populations of Eurasia until 1492, when Christopher Columbus sailed into Caribbean waters on a quest to find a sea route to Asia. 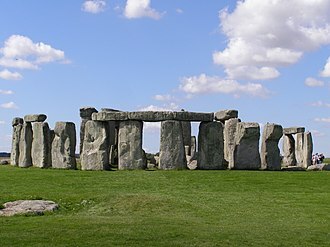 At that time the Western Hemisphere in general was unknown to most Europeans, although it had been discovered between the years 800 and 1000 by the vikings. Following the discovery of the islands by Columbus, the area was quickly colonized by several Western cultures (initially Spain, then later England, the Dutch Republic, France, Courland and Denmark). Following the colonization of the Caribbean islands, the Caribbean Sea became a busy area for European-based marine trading and transports, and this commerce eventually attracted pirates such as Samuel Bellamy and Blackbeard. As of 2015[update] the area is home to 22 island territories and borders 12 continental countries. 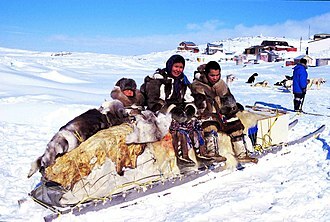 On the North. In the Windward Channel – a line joining Caleta Point (74°15′W) and Pearl Point (19°40′N) in Haïti. In the Mona Passage – a line joining Cape Engaño and the extreme of Agujereada (18°31′N 67°08′W﻿ / ﻿18.517°N 67.133°W﻿ / 18.517; -67.133) in Puerto Rico. Eastern limits. From Point San Diego (Puerto Rico) Northward along the meridian thereof (65°39′W) to the 100-fathom line, thence Eastward and Southward, in such a manner that all islands, shoals and narrow waters of the Lesser Antilles are included in the Caribbean Sea as far as Galera Point (Northeast extremity of the island of Trinidad). From Galera Point through Trinidad to Galeota Point (Southeast extreme) and thence to Baja Point (9°32′N 61°0′W﻿ / ﻿9.533°N 61.000°W﻿ / 9.533; -61.000) in Venezuela. 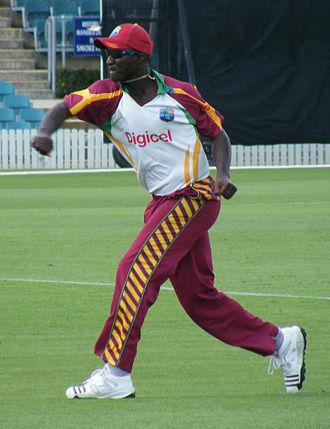 Note that, although Barbados is an island on the same continental shelf, it is considered to be in the Atlantic Ocean rather than the Caribbean Sea. The Caribbean Sea is an oceanic sea largely situated on the Caribbean Plate. The Caribbean Sea is separated from the ocean by several island arcs of various ages. The youngest stretches from the Lesser Antilles to the Virgin Islands to the north east of Trinidad and Tobago off the coast of Venezuela. This arc was formed by the collision of the South American Plate with the Caribbean Plate and includes active and extinct volcanoes such as Mount Pelee, the Quill (volcano) on Sint Eustatius in the Caribbean Netherlands and Morne Trois Pitons on Dominica. The larger islands in the northern part of the sea Cuba, Hispaniola, Jamaica and Puerto Rico lie on an older island arc. The geological age of the Caribbean Sea is estimated to be between 160 and 180 million years and was formed by a horizontal fracture that split the supercontinent called Pangea in the Mesozoic Era. It is assumed the proto-caribbean basin existed in the Devonian period. 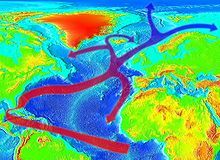 In the early Carboniferous movement of Gondwana to the north and its convergence with the Euramerica basin decreased in size. The next stage of the Caribbean Sea's formation began in the Triassic. Powerful rifting led to the formation of narrow troughs, stretching from modern Newfoundland to the west coast of the Gulf of Mexico which formed siliciclastic sedimentary rocks. In the early Jurassic due to powerful marine transgression, water broke into the present area of the Gulf of Mexico creating a vast shallow pool. The emergence of deep basins in the Caribbean occurred during the Middle Jurassic rifting. 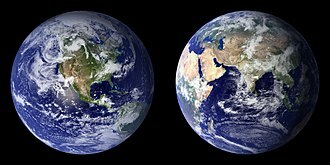 The emergence of these basins marked the beginning of the Atlantic Ocean and contributed to the destruction of Pangaea at the end of the late Jurassic. During the Cretaceous the Caribbean acquired the shape close to that seen today. In the early Paleogene due to Marine regression the Caribbean became separated from the Gulf of Mexico and the Atlantic Ocean by the land of Cuba and Haiti. 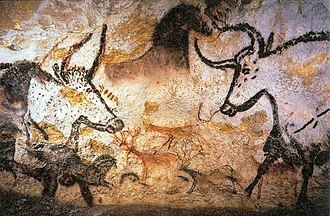 The Caribbean remained like this for most of the Cenozoic until the Holocene when rising water levels of the oceans restored communication with the Atlantic Ocean. The shaded relief map of the Caribbean Sea and Gulf of Mexico area. The Caribbean's floor is composed of sub-oceanic sediments of deep red clay in the deep basins and troughs. On continental slopes and ridges calcareous silts are found. 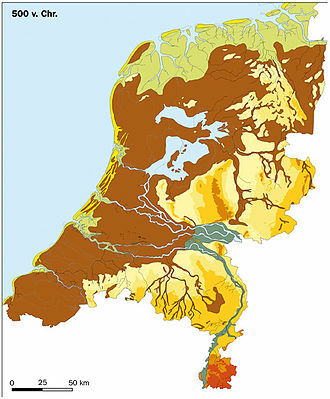 Clay minerals likely having been deposited by the mainland river Orinoco and the Magdalena River. Deposits on the bottom of the Caribbean Sea and Gulf of Mexico have a thickness of about 1 km (0.62 mi). Upper sedimentary layers relate to the period from the Mesozoic to the Cenozoic (250 million years ago to present) and the lower layers from the Paleozoic to the Mesozoic. The Caribbean sea floor is divided into five basins separated from each other by underwater ridges and mountain ranges. Atlantic Ocean water enters the Caribbean through the Anegada Passage lying between the Lesser Antilles and Virgin Islands and the Windward Passage located between Cuba and Haiti. The Yucatán Channel between Mexico and Cuba links the Gulf of Mexico with the Caribbean. The deepest points of the sea lie in Cayman Trough with depths reaching approximately 7,686 m (25,220 ft). Despite this, the Caribbean Sea is considered a relatively shallow sea in comparison to other bodies of water. The pressure of the South American Plate to the east of the Caribbean causes the region of the Lesser Antilles to have high volcanic activity. There was a very serious eruption of Mount Pelée in 1902 which caused many casualties. The Caribbean sea floor is also home to two oceanic trenches: the Cayman Trench and Puerto Rico Trench, which put the area at a high risk of earthquakes. Underwater earthquakes pose a threat of generating tsunamis which could have a devastating effect on the Caribbean islands. Scientific data reveals that over the last 500 years the area has seen a dozen earthquakes above 7.5 magnitude. Most recently, a 7.1 earthquake struck Haiti on January 12, 2010. The hydrology of the sea has a high level of homogeneity. Annual variations in monthly average water temperatures at the surface do not exceed 3 °C (5.4 °F). Over the past fifty years the Caribbean has gone through three stages: cooling until 1974; a cold phase with peaks during 1974–1976 and 1984–1986 then; a warming phase with an increase in temperature of 0.6 °C (1.1 °F) per year. Virtually all temperature extremes were associated with the phenomena of El Niño and La Niña. The salinity of seawater is about 3.6% and its density is 1,023.5–1,024.0 kg/m3 (63.90–63.93 lb/cu ft). The surface water colour is blue-green to green. The Caribbean's depth in its wider basins and deep water temperatures are similar to those of the Atlantic. Atlantic deep water is thought to spill into the Caribbean and contribute to the general deep water of its sea. The surface water (30 m; 100 feet) acts as an extension of the northern Atlantic as the Guiana Current and part of the North Equatorial Current enter the sea on the east. On the western side of the sea the trade winds influence a northerly current which causes an upwelling and a rich fishery near Yucatán. The Caribbean is home to about 9% of the world's coral reefs covering about 50,000 km2 (19,000 sq mi), most of which are located off the Caribbean Islands and the Central American coast. Among them stands out the Belize Barrier Reef with an area of 963 km2 (372 sq mi) which was declared a World Heritage Site in 1996. It forms part of the Great Mayan Reef also known as the MBRS and being over 1,000 km (600 mi) in length is the world's second longest. It runs along the Caribbean coasts of Mexico, Belize, Guatemala and Honduras. During the past ten years,[when?] unusually warm Caribbean waters have been increasingly threatening Caribbean coral reefs. Coral reefs support some of the most diverse marine habitats in the world, but they are fragile ecosystems. When tropical waters become unusually warm for extended periods of time, microscopic plants called zooxanthellae, which are symbiotic partners living within the coral polyp tissues, die off. These plants provide food for the corals, and give them their color. The result of the death and dispersal of these tiny plants is called coral bleaching, and can lead to the devastation of large areas of reef. 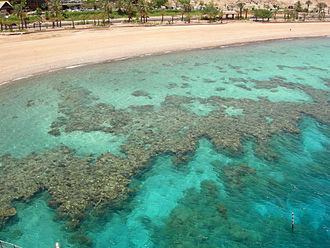 Over 42% of corals are completely bleached and 95% are experiencing some type of whitening. Historically the Caribbean is thought to contain 14% of the world's coral reefs. The habitats supported by the reefs are critical to such tourist activities as fishing and diving, and provide an annual economic value to Caribbean nations of US$3.1–4.6 billion. 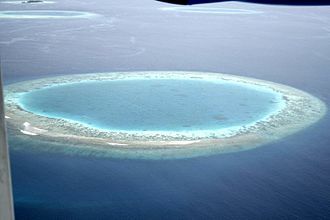 Continued destruction of the reefs could severely damage the region's economy. A Protocol of the Convention for the Protection and Development of the Marine Environment of the Wider Caribbean Region came in effect in 1986 to protect the various endangered marine life of the Caribbean through forbidding human activities that would advance the continued destruction of such marine life in various areas. Currently this protocol has been ratified by 15 countries. Also, several charitable organisations have been formed to preserve the Caribbean marine life, such as Caribbean Conservation Corporation which seeks to study and protect sea turtles while educating others about them. 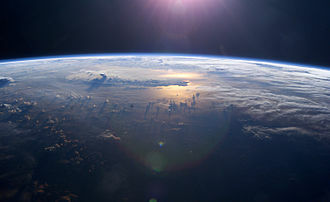 In connection with the foregoing, the Institute of Marine Sciences and Limnology of the National Autonomous University of Mexico, conducted a regional study, funded by the Department of Technical Cooperation of the International Atomic Energy Agency, in which specialists from 11 Latin American countries (Colombia, Costa Rica, Cuba, Guatemala, Haiti, Honduras, Mexico, Nicaragua, Panama, Dominican Republic, Venezuela plus Jamaica) participated. The findings indicate that heavy metals such as mercury, arsenic, and lead, have been identified in the coastal zone of the Caribbean Sea. Analysis of toxic metals and hydrocarbons is based on the investigation of coastal sediments that have accumulated less than 50 meters deep during the last hundred and fifty years. The project results were presented in Vienna in the forum "Water Matters", and the 2011 General Conference of said multilateral organization. Average sea surface temperatures for the Caribbean Atlantic Ocean (25–27 August 2005). Hurricane Katrina is seen just above Cuba. The climate of the Caribbean is driven by the low latitude and tropical ocean currents that run through it. The principle ocean current is the North Equatorial Current, which enters the region from the tropical Atlantic. The climate of the area is tropical, varying from tropical rainforest in some areas to tropical savanna in others. 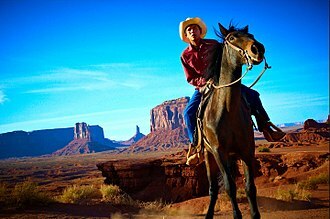 There are also some locations that are arid climates with considerable drought in some years. Tropical cyclones are a threat to the nations that rim the Caribbean Sea. While landfalls are infrequent, the resulting loss of life and property damage makes them significant hazard to life in the Caribbean. Tropical cyclones that impact the Caribbean often develop off the West coast of Africa and make their way west across the Atlantic Ocean toward the Caribbean, while other storms develop in the Caribbean itself. The Caribbean hurricane season as a whole lasts from June through November, with the majority of hurricanes occurring during August and September. On average around 9 tropical storms form each year, with 5 reaching hurricane strength. According to the National Hurricane Center 385 hurricanes occurred in the Caribbean between 1494 and 1900. The region has a high level of biodiversity and many species are endemic to the Caribbean. The vegetation of the region is mostly tropical but differences in topography, soil and climatic conditions increase species diversity. Where there are porous limestone terraced islands these are generally poor in nutrients. 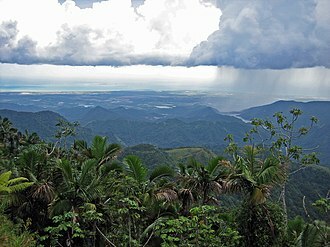 It is estimated that 13,000 species of plants grow in the Caribbean of which 6,500 are endemic. For example, guaiac wood (Guaiacum officinale), the flower of which is the national flower of Jamaica and the Bayahibe rose (Pereskia quisqueyana) which is the national flower of the Dominican Republic and the ceiba which is the national tree of both Puerto Rico and Guatemala. The mahogany is the national tree of the Dominican Republic and Belize. The caimito (Chrysophyllum cainito) grows throughout the Caribbean. In coastal zones there are coconut palms and in lagoons and estuaries are found thick areas of black mangrove and red mangrove (Rhizophora mangle). In shallow water flora and fauna is concentrated around coral reefs where there is little variation in water temperature, purity and salinity. Leeward side of lagoons provide areas of growth for sea grasses. Turtle grass (Thalassia testudinum) is common in the Caribbean as is manatee grass (Syringodium filiforme) which can grow together as well as in fields of single species at depths up to 20 m (66 ft). Another type shoal grass (Halodule wrightii) grows on sand and mud surfaces at depths of up to 5 m (16 ft). In brackish water of harbours and estuaries at depths less than 2.5 m (8 ft 2 in) widgeongrass (Ruppia maritima) grows. Representatives of three species belonging to the genus Halophila, (Halophila baillonii, Halophila engelmannii and Halophila decipiens) are found at depths of up to 30 m (98 ft) except for Halophila engelmani which does not grow below 5 m (16 ft) and is confined to the Bahamas, Florida, the Greater Antilles and the western part of the Caribbean. Halophila baillonii has been found only in the Lesser Antilles. Marine biota in the region have representatives of both the Indian and Pacific oceans which were caught in the Caribbean before the emergence of the Isthmus of Panama four million years ago. In the Caribbean Sea there are around 1,000 documented species of fish, including sharks (bull shark, tiger shark, silky shark and Caribbean reef shark), flying fish, giant oceanic manta ray, angel fish, spotfin butterflyfish, parrotfish, Atlantic Goliath grouper, tarpon and moray eels. Throughout the Caribbean there is industrial catching of lobster and sardines (off the coast of Yucatán Peninsula). There are 90 species of mammals in the Caribbean including sperm whales, humpback whales and dolphins. The island of Jamaica is home to seals and manatees. The Caribbean monk seal which lived in the Caribbean is considered extinct. The solenodon is endangered. There are 500 species of reptiles (94% of which are endemic). Islands are inhabited by some endemic species such as rock iguanas and American crocodile. The blue iguana, endemic to the island of Grand Cayman, is endangered. The green iguana is invasive to Grand Cayman. The Mona ground iguana which inhabits the island of Mona, Puerto Rico, is endangered. The rhinoceros iguana from the island of Hispaniola which is shared between Haiti and the Dominican Republic is also endangered. The region has several types of sea turtle (loggerhead, green turtle, hawksbill, leatherback turtle, Atlantic ridley and olive ridley). Some species are threatened with extinction. Their populations have been greatly reduced since the 17th century – the number of green turtles has declined from 91 million to 300,000 and hawksbill turtles from 11 million to less than 30,000 by 2006. All 170 species of amphibians that live in the region are endemic. The habitats of almost all members of the toad family, poison dart frogs, tree frogs and leptodactylidae (a type of frog) are limited to only one island. The Golden coqui is in serious threat of extinction. In the Caribbean 600 species of birds have been recorded of which 163 are endemic such as the tody, Fernandina's flicker and palmchat. The American yellow warbler is found in many areas as is the green heron. Of the endemic species 48 are threatened with extinction including the Puerto Rican amazon, yellow-breasted crake and the Zapata wren. According to Birdlife International in 2006 in Cuba 29 species of bird are in danger of extinction and two species officially extinct. The black-fronted piping guan is endangered as is the plain pigeon. The Antilles along with Central America lie in the flight path of migrating birds from North America so the size of populations is subject to seasonal fluctuations. In the forests are found parrots, bananaquit and toucans. Over the open sea can be seen frigatebirds and tropicbirds. A view of Nevis island from the southeastern peninsula of Saint Kitts. The Caribbean region has seen a significant increase in human activity since the colonization period. The sea is one of the largest oil production areas in the world, producing approximately 170 million tons[clarification needed] per year. The area also generates a large fishing industry for the surrounding countries, accounting for 500,000 tonnes (490,000 long tons; 550,000 short tons) of fish a year. Human activity in the area also accounts for a significant amount of pollution, The Pan American Health Organization estimated in 1993 that only about 10% of the sewage from the Central American and Caribbean Island countries is properly treated before being released into the sea. The Caribbean region supports a large tourism industry. The Caribbean Tourism Organization calculates that about 12 million people a year visit the area, including (in 1991–1992) about 8 million cruise ship tourists. Tourism based upon scuba diving and snorkeling on coral reefs of many Caribbean islands makes a major contribution to their economies. The Caribbean is the setting for countless literary efforts often related to piracy acts and swashbuckling, set during the 17th and 18th centuries. One memorable work of pulp fiction has in its title a geographic feature unique in its way to the islands: Fear Cay, the eleventh Doc Savage adventure by Lester Dent. Many James Bond adventures were set there. It is also well known as the location of the Pirates of the Caribbean films, featuring Port Royal. Peter Matthiessen's Far Tortuga (1975) chronicles the adventures of a turtling crew in the late 1960s. ^ "Mesoamerican Reef | Places | WWF". World Wildlife Fund. Retrieved 2016-10-21. ^ Gorgas, William C. (1912). 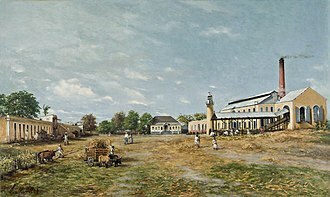 "Sanitation at Panama". Journal of the American Medical Association. American Medical Association. 58 (13): 907. doi:10.1001/jama.1912.04260030305001. ISSN 0002-9955. The Pacific Ocean, south of this isthmus [Panama], was known to the early explorers as the South Sea, and the Caribbean, lying to the north, as the North Sea. ^ Amante, C. and B.W. Eakins, 2009. ETOPO1 1 Arc-Minute Global Relief Model: Procedures, Data Sources and Analysis. NOAA Technical Memorandum NESDIS NGDC-24. National Geophysical Data Center, NOAA. doi:10.7289/V5C8276M [access date: 2015-03-18]. ^ Dawicki, Shelley. "Tsunamis in the Caribbean? It's Possible". Oceanus. Retrieved April 30, 2006. ^ Pernetta, John. (2004). Guide to the Oceans. Buffalo, NY: Firefly Books, Inc. p. 178. ISBN 978-1-55297-942-6. ^ Pernetta, John. (2004). Guide to the Oceans. Buffalo, NY: Firefly Books, Inc. pp. 177–178. ISBN 978-1-55297-942-6. ^ Status of coral reefs in the Caribbean and Atlantic Ocean Archived June 21, 2006, at the Wayback Machine World Resource Institute. URL accessed on April 29, 2006. ^ Elder, Danny and Pernetta, John. (1991). The Random House atlas of the oceans. New York : Random House. 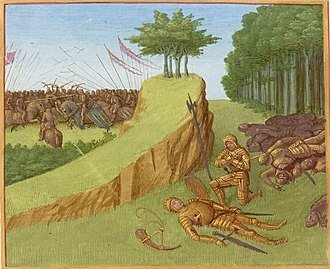 p. 124. ISBN 9780679408307. ^ Alarm sounded for Caribbean coral. BBC News. URL accessed on April 29, 2006. ^ Protocol Concerning Specially Protected Areas and Wildlife to the Convention for the Protection and Development of the Marine Environment of the Wider Caribbean Region (SPAW) NOAA Fisheries: Office of Protected Resources. URL accessed on April 30, 2006. ^ Caribbean Conservation Corporation Archived October 1, 2006, at the Wayback Machine Orion Online. URL last accessed May 1, 2006. ^ Analysis of Contaminants in the Caribbean Sea over the last 150 years. National Autonomous University of Mexico (UNAM) 2012 (Spa). ^ "NASA – NASA Satellites Record a Month for the Hurricane History Books". www.nasa.gov. ^ Caribbean seagrass. Seagrass watch, retrieved April 23, 2009. ^ Robert James Menzies, John C Ogden. "Caribbean Sea". 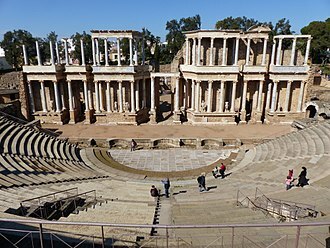 Britannica Online Encyclopaedia. ^ Severin Carrell, "Caribbean Sea Turtles Close to Extinction", The Independent, 28 November 2004. 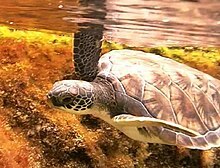 ^ Historic Caribbean Sea Turtle Population falls 99%. Plunge has significant ecological consequences. Mongabay.com (August 1, 2006). ^ Conservation International Caribbean Islands, Threatened Species. ^ "Birdlife International" – Red List Cuba. ^ a b An Overview of Land Based Sources of Marine Pollution Caribbean Environment Programme. URL last accessed May 14, 2006. ^ LME 12: Caribbean Sea Archived 2006-05-04 at the Wayback Machine NOAA Fisheries Northeast Fisheries Science Center Narragansett Laboratory. URL last accessed May 14, 2006. ^ Reefs at Risk in the Caribbean: Economic Valuation Methodology Archived 2012-02-27 at the Wayback Machine World Resources Institute 2009. 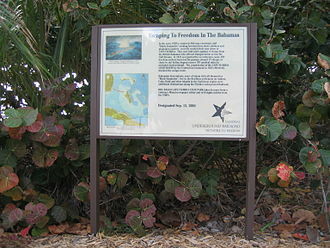 Wikimedia Commons has media related to Caribbean Sea. Reefs at Risk in the Caribbean: Economic Valuation Methodology, World Resources Institute 2007. 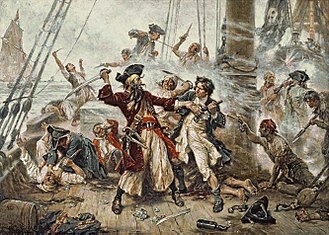 The period during which pirates were most successful was from the 1660s to 1730s. Piracy flourished in the Caribbean because of the existence of pirate seaports such as Port Royal in Jamaica, Tortuga in Haiti, Pirates were often former sailors experienced in naval warfare. The buccaneers were chased off their islands by colonial authorities and had to seek a new life at sea, beginning in the 16th century, pirate captains recruited seamen to loot European merchant ships, especially the Spanish treasure fleets sailing from the Caribbean to Europe. This officially sanctioned piracy was known as privateering, from 1520 to 1560, French privateers were alone in their fight against the Crown of Spain and the vast commerce of the Spanish Empire in the New World, but were joined by the English and Dutch. The Caribbean had become a center of European trade and colonization after Columbus discovery of the New World for Spain in 1492. 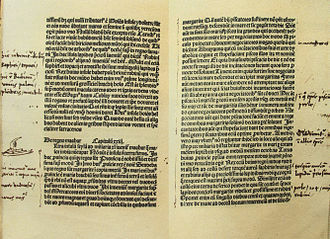 In the 1493 Treaty of Tordesillas the non-European world had been divided between the Spanish and the Portuguese along a north-south line 270 leagues west of the Cape Verde and this gave Spain control of the Americas, a position the Spaniards reiterated with an equally unenforceable papal bull. In the 16th century, the Spanish were mining extremely large quantities of silver from the mines of Zacatecas in New Spain, to combat this constant danger, in the 1560s the Spanish adopted a convoy system. A treasure fleet or flota would sail annually from Seville in Spain, carrying passengers and this cargo, though profitable, was really just a form of ballast for the fleet as its true purpose was to transport the years worth of silver to Europe. This made the returning Spanish treasure fleet a tempting target, although pirates were more likely to shadow the fleet to attack stragglers than to engage the main vessels. South and west of these lines, respectively, no protection could be offered to non-Spanish ships, English and French pirates and settlers moved into this region even in times of nominal peace with the Spanish. These laws allowed only Spanish merchants to trade with the colonists of the Spanish Empire in the Americas and this arrangement provoked constant smuggling against the Spanish trading laws and new attempts at Caribbean colonization in peacetime by England and the Netherlands. 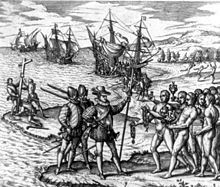 Whenever a war was declared in Europe between the Great Powers the result was always widespread piracy and privateering throughout the Caribbean, the Anglo-Spanish War in 1585–1604 was partly due to trade disputes in the New World. However, very profitable trade continued between Spains colonies, which continued to expand until the early 19th century, as Spains military might in Europe weakened, the Spanish trading laws in the New World were violated with greater frequency by the merchants of other nations. Additional problems came from shortage of supplies because of the lack of people to work farms. 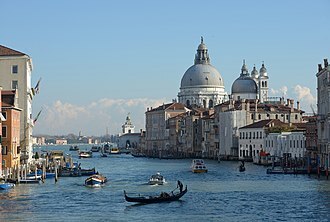 England especially began to turn its peoples maritime skills into the basis of commercial prosperity, as for the Dutch Netherlands, after decades of rebellion against Spain fueled by both Dutch nationalism and their staunch Protestantism, independence had been gained in all but name. The Netherlands had become Europes economic powerhouse, each possessed a large population and a self-sustaining economy, and was well-protected by Spanish defenders. The Gulf of Paria is a 7,800 km2 shallow semi-enclosed inland sea located between the island of Trinidad and the east coast of Venezuela. The Gulf of Paria is considered to be one of the best natural harbours on the Atlantic coast of the Americas. The jurisdiction of the Gulf of Paria is split between Trinidad and Tobago and Venezuela with Trinidad and Tobago having control over approximately 2,940 km2 and Venezuela the remainder. It was originally named the Gulf of the Whale by Christopher Columbus, cartographic sources of the late 18th century repeatedly refer to it as the Sad Gulf. In the north, the gulf is connected to the Caribbean Sea through the Dragons Mouths between the Paria Peninsula of Venezuela and the Chaguaramas Peninsula of Trinidad. In the south, the gulf is connected to the Atlantic through the Columbus Channel, known as the Serpents Mouth, the Gulf of Paria lies entirely within the broad strike-slip plate boundary zone of the southeastern Caribbean. The structure of the Gulf consists of a set of transtensional basins superimposed on a fold-and-thrust belt. The petroleum of Trinidad has been generated by prolific Upper Cretaceous source rocks, time equivalent to the La Luna and Querecual formations in Columbia and these source rocks were overlain by a thick succession of Paleogene deep water sediments and shallow marine siliciclastic reservoir rocks. The transpression due to the influence of the Caribbean plate created several sub-basins across the Trinidad area, the hydrocarbon basins in Trinidad are Southern Basin, Columbus Basin, Carupano Basin, Central Range/Darrien Rdige Basin and the Caroni Basin and Gulf of Paria Pull-apart Basin. The Caroni Basin is a Cenozoic basin bounded to the north by the El Pilar fault zone and its stratigraphy features a shallowing section from the Miocene which overlies Palaeocene and Lower Cretaceous deep water sediments. The Gulf of Paria is the offshore extension of the Caroni basin. However its deformation is now due to the right-stepping of the dextral El Pilar fault to the dextral Warm Springs fault. The Los Bajos fault separates the Gulf of Paria from the Southern basin sediments, natural gas has been discovered in the onshore Caroni basin while in the Gulf of Paria, both oil and gas have been discovered. Haiti, officially the Republic of Haiti and formerly called Hayti, is a country located on the island of Hispaniola in the Greater Antilles archipelago of the Caribbean Sea. 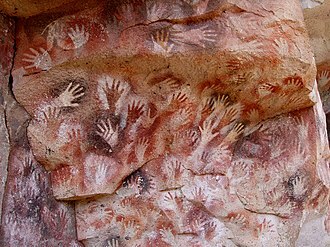 It occupies the western three-eighths of the island, which it shares with the Dominican Republic, the region was originally inhabited by the indigenous Taíno people. Spain discovered the island on 5 December 1492 during the first voyage of Christopher Columbus across the Atlantic, when Columbus initially landed in Haiti, he had thought he had found India or Asia. 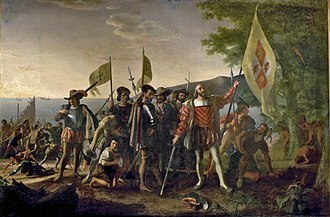 On Christmas Day 1492, Columbus flagship the Santa Maria ran aground north of what is now Limonade, the island was named La Española and claimed by Spain, which ruled until the early 17th century. 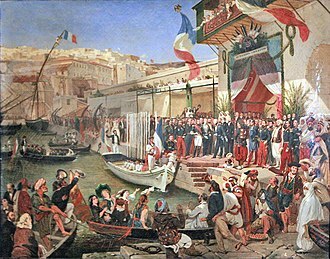 Competing claims and settlements by the French led to the portion of the island being ceded to France. 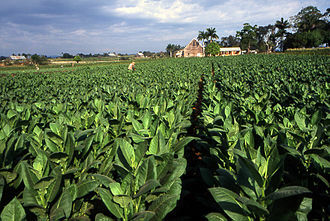 The development of plantations, worked by slaves brought from Africa. 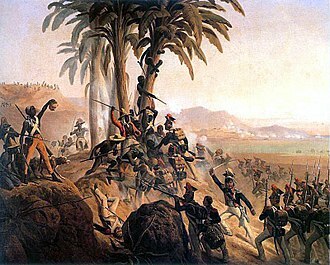 Upon his death in a prison in France, he was succeeded by his lieutenant, Jean-Jacques Dessalines, the Haitian Revolution lasted just over a dozen years, and apart from Alexandre Pétion, the first President of the Republic, all the first leaders of government were former slaves. The Citadelle Laferrière is the largest fortress in the Americas, Henri Christophe – former slave and first king of Haiti, Henri I – built it to withstand a possible foreign attack. 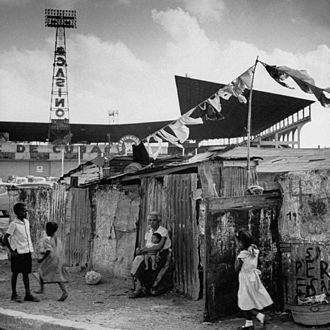 It has the lowest Human Development Index in the Americas, most recently, in February 2004, a coup détat originating in the north of the country forced the resignation and exile of President Jean-Bertrand Aristide. 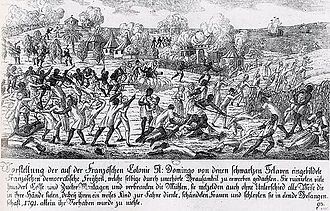 A provisional government took control with security provided by the United Nations Stabilization Mission in Haiti, the name Haïti comes from the indigenous Taíno language which was the native name given to the entire island of Hispaniola to mean, land of high mountains. The h is silent in French and the ï in Haïti, is a mark used to show that the second vowel is pronounced separately. In English, this rule for the pronunciation is often disregarded, the name Haïti was restored by Haitian revolutionary Jean-Jacques Dessalines as the official name of independent Saint-Domingue, as a tribute to the Amerindian predecessors. Edward Teach or Edward Thatch, better known as Blackbeard, was a notorious English pirate who operated around the West Indies and the eastern coast of Britains North American colonies. 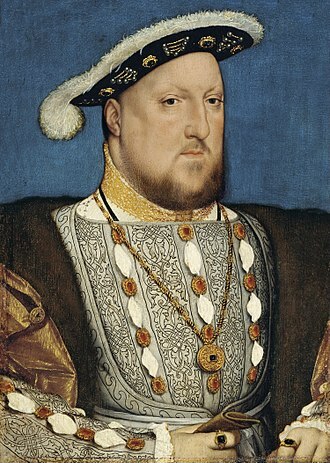 Although little is known about his life, he was probably born in Bristol. Recent genealogical research indicates his family moved to Jamaica where Edward Thatch, Hornigold placed him in command of a sloop he had captured, and the two engaged in numerous acts of piracy. Teach captured a French merchant vessel, renamed her Queen Annes Revenge and he became a renowned pirate, his cognomen derived from his thick black beard and fearsome appearance, he was reported to have tied lit fuses under his hat to frighten his enemies. He formed an alliance of pirates and blockaded the port of Charles Town, after successfully ransoming its inhabitants, he ran Queen Annes Revenge aground on a sandbar near Beaufort, North Carolina. He parted company with Bonnet and settled in Bath Town, where he accepted a royal pardon, but he was soon back at sea, where he attracted the attention of Alexander Spotswood, the Governor of Virginia. 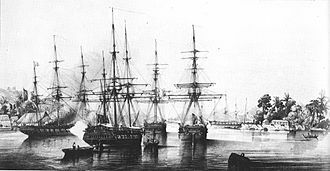 Spotswood arranged for a party of soldiers and sailors to try to capture the pirate, during a ferocious battle and several of his crew were killed by a small force of sailors led by Lieutenant Robert Maynard. A shrewd and calculating leader, Teach spurned the use of force and he was romanticised after his death and became the inspiration for pirate-themed works of fiction across a range of genres. Little is known about Blackbeards early life and it is commonly believed that at the time of his death he was between 35 and 40 years old and thus born in about 1680. In contemporary records his name is most often given as Blackbeard, Edward Thatch or Edward Teach, several spellings of his surname exist—Thatch, Thache, Tack and Theach. One early source claims that his surname was Drummond, but the lack of any supporting documentation makes this unlikely. Pirates habitually used fictitious surnames while engaged in the business of piracy, so as not to tarnish the family name, the author Robert Lee speculated that Teach may therefore have been born into a respectable, wealthy family. Puerto Rico, officially the Commonwealth of Puerto Rico and briefly called Porto Rico, is an unincorporated territory of the United States located in the northeast Caribbean Sea. It is an archipelago that includes the island of Puerto Rico and a number of smaller ones such as Mona, Culebra. The capital and most populous city is San Juan and its official languages are Spanish and English, though Spanish predominates. The islands population is approximately 3.4 million, Puerto Ricos rich history, tropical climate, diverse natural scenery, renowned traditional cuisine, and attractive tax incentives make it a popular destination for travelers from around the world. Four centuries of Spanish colonial government transformed the ethnic and physical landscapes primarily with waves of African captives, and Canarian. 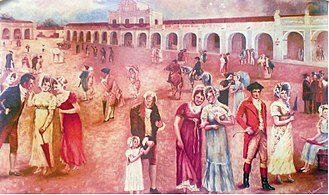 In the Spanish imperial imagination, Puerto Rico played a secondary, in 1898, following the Spanish–American War, the United States appropriated Puerto Rico together with most former Spanish colonies under the terms of the Treaty of Paris. Puerto Ricans are natural-born citizens of the United States, Puerto Rico does not have a vote in the United States Congress, which governs the territory with full jurisdiction under the Puerto Rico Federal Relations Act of 1950. As a U. S. territory, American citizens residing on the island are disenfranchised at the level and may not vote for president. However, Congress approved a constitution, allowing U. S. citizens on the territory to elect a governor. A fifth referendum will be held in June 2017, with only Statehood, in early 2017, the Puerto Rican government-debt crisis posed serious problems for the government. The outstanding bond debt that had climbed to $70 billion or $12,000 per capita at a time with 12. 4% unemployment, the debt had been increasing during a decade long recession. 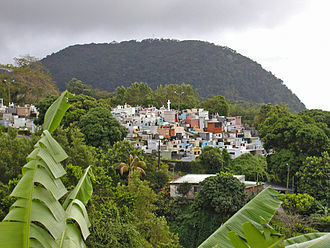 Puerto Ricans often call the island Borinquen – a derivation of Borikén, its indigenous Taíno name, the terms boricua and borincano derive from Borikén and Borinquen respectively, and are commonly used to identify someone of Puerto Rican heritage. Quintana Roo, officially the Free and Sovereign State of Quintana Roo, is one of the 31 states which, with the Federal District, make up the 32 federal entities of Mexico. It is divided into ten municipalities and its capital city is Chetumal and it is located in Southeastern Mexico, on the eastern part of the Yucatán Peninsula. Quintana Roo has a coastline to the east with the Caribbean Sea and it claims territory which gives it a small border with Guatemala in the southwest of the state, although this disputed area is claimed by Campeche. 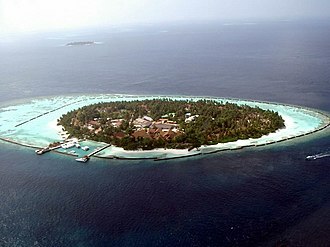 The Sian Kaan biosphere reserve is located in the state. 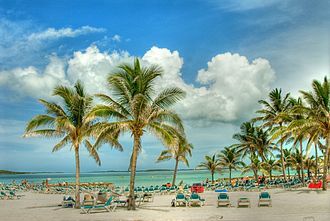 The statewide population is expanding at a rapid rate due to the construction of hotels, many immigrants come from Yucatán, Campeche and Veracruz. On February 1,2015, Quintana Roo officially adopted a new zone, which is five hours behind Coordinated Universal Time. Reasons cited for the change include coordination of air travel, banking operations, and more daylight hours, the area that makes up modern Quintana Roo was long part of Yucatán, sharing its history. 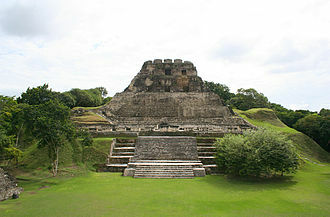 With the Caste War of Yucatán, which started in the 1840s, the independent Maya nation of Chan Santa Cruz was based on what is now the town of Felipe Carrillo Puerto. 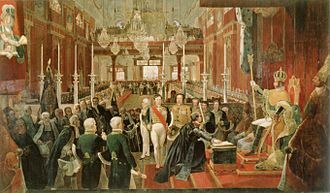 For decades it maintained independence, having separate trade and treaty relationships with British Honduras. Quintana Roo was made a territory of Mexico by decree of President Porfirio Díaz on November 24,1902 and it was named after an early patriot of the Mexican Republic, Andrés Quintana Roo. 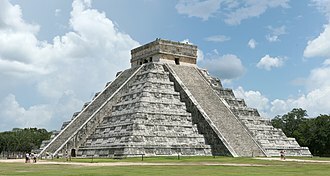 The Mexican army succeeded in defeating most of the Maya population of the region during the 1910s, in 1915 the area was again declared to be legally part of the state of Yucatán. Quintana Roo was granted statehood within the United Mexican States on October 8,1974 and it is the Mexican Republics youngest state. According to the Köppen climate classification, much of the state has a tropical wet, the mean annual temperature is 26 °C. The hottest months are April and August where the high is 33 °C while January is coldest month with an average low of 17 °C. 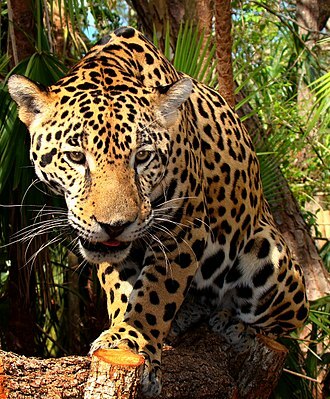 Belizean jungles are home to the jaguar and many other mammals. Cockscomb Basin Wildlife Sanctuary was founded in 1990 as the first wilderness sanctuary for the jaguar and is regarded by one author as the premier site for jaguar preservation in the world. 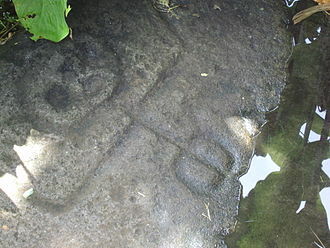 An Arawak stone carving uncovered in Guadeloupe. 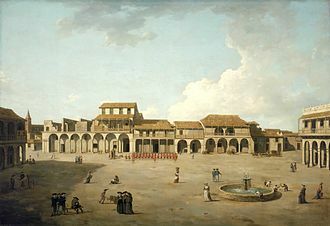 The Piazza (or main square) in central Havana, Cuba, in 1762, during the Seven Years' War. Sir Ralph Abercromby, Commander of the British forces that captured Trinidad and Tobago. 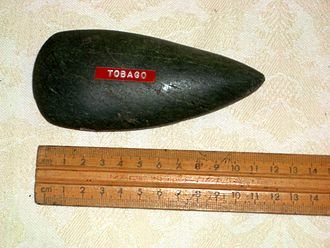 Greenstone ceremonial axe. From shell midden, Mt Irvine Bay, Tobago, 1957. Windows in the Castillo's sea-facing wall. 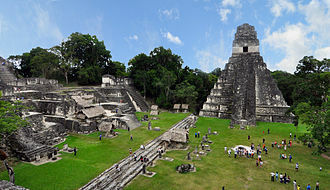 Calakmul was one of the most important Classic period cities.